Laguna Beach Police Department has been awarded a $115,000 grant from the California Office of Traffic Safety (OTS) for a year-long enforcement and public awareness program. The traffic safety program is intended to educate the public on safe roadway habits and deter people from violating traffic laws or practicing other unsafe behaviors that lead to injuries and fatalities. 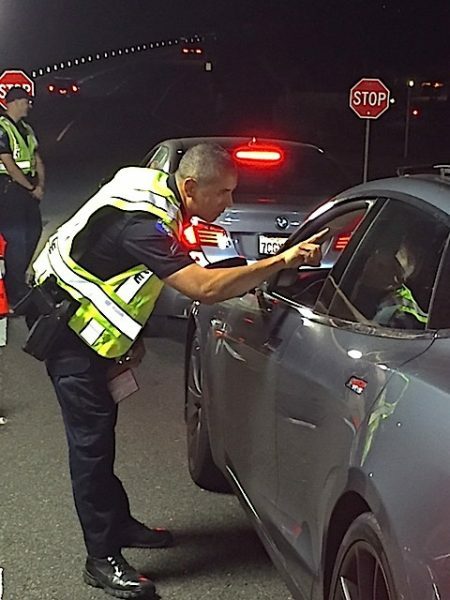 Corporal Darrel Short uses the nystagmus test to detect if a motorist is suspected of drunk driving at a checkpoint near Aliso Beach.